Father Bernard Head, a retired priest of the Archdiocese of Indianapolis, died on May 10 at Providence Health Care in St. Mary-of-the-Woods. He was 89. The Mass of Christian Burial was celebrated on May 15 at the Church of the Immaculate Conception at the motherhouse of the Sisters of Providence of Saint Mary-of-the-Woods, where he had served as chaplain from 1986-91. Msgr. William F. Stumpf, archdiocesan administrator, was the principal celebrant of the Mass. Father Stephen Giannini was the homilist. Burial followed in the priests’ circle of the Sisters of Providence’s cemetery. Ordained in 1953, Father Head served for many years in education at various institutions in Indianapolis and at St. Mary-of-the-Woods College, and spent the last three decades of his priestly life and ministry in the Terre Haute Deanery. Father Richard Ginther had Father Head as an English instructor at the former Latin School, an archdiocesan high school seminary, in the mid-1960s, and later served with him in the Terre Haute Deanery from 2005-16. The pastor of Our Lady of Lourdes Parish in Indianapolis and director of the archdiocesan Office of Ecumenism, Father Ginther said that Father Head influenced his priestly formation through his personality that he described as “calm, not regal, but proper,” and his preaching. Retired Father John Fink also was a student in Father Head’s classes. After he was ordained, Father Fink appreciated how his former instructor made himself available to his brother priests. He was also a priest that helped women religious enter more deeply into their vocation, said Providence Sister Joan Slobig, who knew Father Head beginning in 1984 when he first came to minister as assistant chaplain for the Sisters of Providence. They collaborated in the theology department at Saint Mary-of-the-Woods College, from 2002-12 at St. Mary-of-the-Woods Parish in St. Mary-of-the-Woods and from 2002-2011 at the former St. Leonard of Port Maurice Parish in West Terre Haute. Father Head was the sacramental minister for the two faith communities, which were led by Sister Joan as their parish life coordinator. “His homilies were a gift,” Sister Joan said. “They deepened my spiritual life and my love of Scripture. We shared a belief that nurturing the life of the mind is essential to human growth and to ministry. Father Ginther said that Father Head and Sister Joan were “an excellent pastoral team.” He also appreciated being able to minister with Father Head so many years after having learned from him at the Latin School. Bernard Head was born on Sept. 2, 1927, in Indianapolis to Ira and Evelyn Head. They later moved to Seymour. He graduated from Seymour High School in 1942. He was a seminarian at Saint Meinrad Seminary in St. Meinrad from 1942-46 and then at Theological College at The Catholic University of America in Washington from 1946-53. He later earned graduate degrees in educational administration at Butler University in Indianapolis and in English at the University of Notre Dame in northern Indiana. Father Head was ordained a priest on June 7, 1953, at St. Ambrose Church in Seymour by Archbishop Paul C. Schulte. His first pastoral assignment was as assistant pastor of the former Holy Trinity Parish in Indianapolis from 1953-54. His long service of ministry in education began in 1954 when he was appointed as assistant chaplain at the former Ladywood School in Indianapolis, serving there for two years. From 1956-66, Father Head served on the formation staff at the former Latin School in Indianapolis, which at the time was the archdiocese’s high school seminary. During that time, he also served from 1956-64 as assistant pastor of Our Lady of the Most Holy Rosary Parish in Indianapolis. From 1964-81, Father Head served on the faculty of Marian University in Indianapolis, also serving as chaplain there for a period. While teaching at Marian, Father Head also ministered as administrator of St. Jude Parish in Spencer from 1966-68, as pastor of St. Thomas More Parish in Mooresville from 1972-74 and as chaplain of Our Lady of Grace Monastery in Beech Grove from 1979-81. In 1977, he began ministry as an appellate judge in the archdiocesan Metropolitan Tribunal and would continue in that ministry until 2000. Father Head also served for two terms on what is now the archdiocesan Council of Priests and was elected its first president. For a period in 1981, Father Head resided at the former St. Mark Priory in South Union, Ky. Later that year, he was appointed associate pastor of St. Christopher Parish in Indianapolis. From 1982-84, he ministered as the co-pastor of St. Luke the Evangelist Parish in Indianapolis. 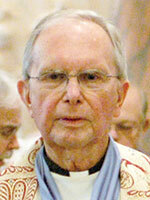 He served as chaplain at the motherhouse from 1984-98, and as dean of the Terre Haute Deanery from 1991-94. Father Head ministered at St. Mary-of-the-Woods Parish in St. Mary-of-the-Woods as administrator from 1988-93, as sacramental minister from 2002-12, and as priest moderator from 2005-12. He also ministered for a period as a chaplain at the United States Penitentiary in Terre Haute. Father Head also served as sacramental minister and priest moderator of the former St. Leonard of Port Maurice Parish in West Terre Haute from 2002 until its closure in 2011.